"It's gargantuan seven storied structure with no apparent rhyme or reason…" CBS Films has debuted the second official trailer for the horror thriller film titled Winchester: The House That Ghosts Built, now titled simply just Winchester (because who wants to remember that very long title, I guess?). 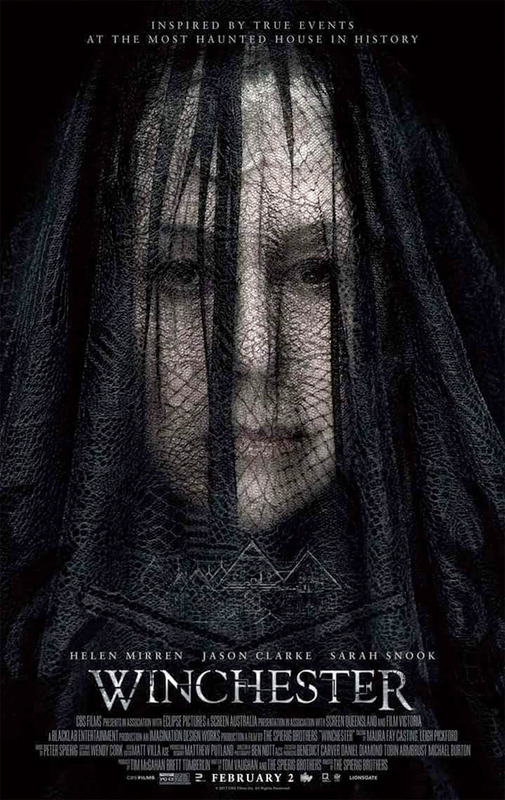 Inspired by true events, the film tells the story of "the most haunted house in the world", built by Sarah Winchester, played by Helen Mirren, heiress to the Winchester (weaponry) fortune. The huge house, located 50 miles outside of San Francisco, stands seven stories tall and contains hundreds of rooms. Apparently Winchester built this house as a prison, an asylum for hundreds of vengeful ghosts. The cast includes Jason Clarke, Sarah Snook, Angus Sampson, Laura Brent, Tyler Coppin, and Dawayne Jordan. This does look fairly creepy, and I'm hoping the house plays a major role with all kinds of scary things coming from inside. You can still watch the first official trailer for Winchester here, to see even more footage from this horror. Inspired by true events. On an isolated stretch of land 50 miles outside of San Francisco sits the most haunted house in the world. Built by Sarah Winchester (Helen Mirren), heiress to the Winchester fortune, it is a house that knows no end. Constructed in an incessant twenty-four hour a day, seven day a week mania for decades, it stands seven stories tall and contains hundreds of rooms. To the outsider it looks like a monstrous monument to a disturbed woman’s madness. But Sarah is not building for herself, for her niece (Sarah Snook) or for the brilliant Doctor Eric Price (Jason Clarke) whom she has summoned to the house. She is building a prison, an asylum for hundreds of vengeful ghosts, and the most terrifying among them have a score to settle with the Winchesters… Winchester: The House That Ghosts Built is directed by Australian brothers Michael Spierig and Peter Spierig, of Undead, Daybreakers, and Predestination previously, plus this year's Jigsaw. The screenplay is by Tom Vaughan, with the Spierig Brothers updating it before filming. CBS Films will release Winchester in theaters starting February 2nd, 2018 early next year.